oh no! A craft I’ve never done…. CORRIGENDUM: This post has been revised – the original post simply referred to “an uncle of mine”. It was rather churlish of me to forget to enumerate all of his fine qualities – which he wasted no time reminding me about, by the way. He is a prince among men, clearly. Sorry, Dennis!! 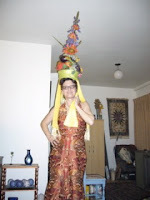 Well, I regret to say (given my big reputation as craft maven of the 21st century and all!) that he was right. 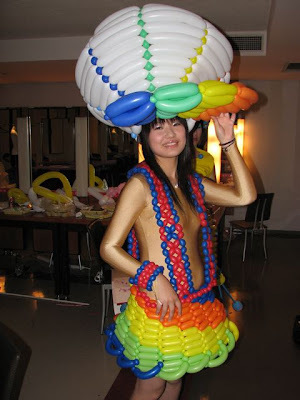 Apparently, people are making fancy costumes out of… balloons! A disco ball hat?! Hmm… Apokreas (greek orthodox version of Mardi Gras – the Greeks having to be different, it actually happens on a Saturday) must be coming up… which I really should know, and would know if I had a church calendar. Or if I ever bothered to go to church, for that matter… oh well. So, how about this one? Another homage to Carmen! Man, she has a lot to answer for. Must watch that Donald Duck movie where she appears again…or, how about this one! 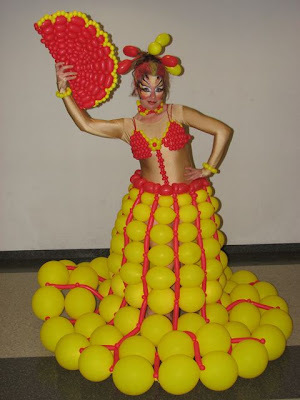 But it’s not just costumes they’re making from balloons… there are some fancy evening dresses as well! Pretty in purple. I do hope my friend Jennifer doesn’t read this – she will want one. If you ever meet Jennifer, do not leave any purple garment unattended around her. I’m serious. 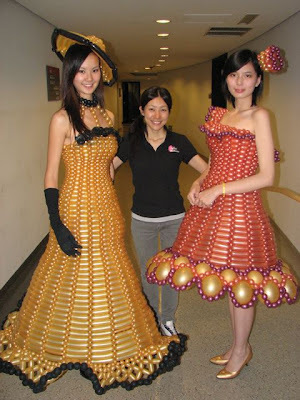 Sadly, in reality I cannot see ever making, much less wearing one of these. Why? 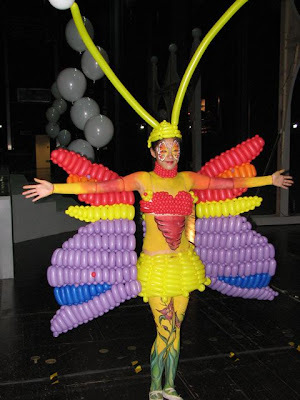 I have a deep dark secret – I’m scared of balloons. Profoundly scared. This is probably why I don’t have kids, actually – if I’m in the vicinity of a balloon I tend to cross the street – which is virtually impossible at a kid’s birthday party, I suppose. So, I would probably be hyperventilating a month in advance of planning the kid’s parties… sigh. (Yes, yes… I know. Ridiculous. However, no more silly, I suppose, than being scared of clowns. Are you scared of clowns? I hadn’t realised how many people were until I sent this linkaround my past workplace suggesting that I make eight masks as a little uniform for us to wear at the Landlord and Tenant Board. I had several freaked-out responses in return, and two serious requests never to send anything like that again. I felt badly… but just had never thought about the possibility of clownphobia. There but for the grace of God go I…. 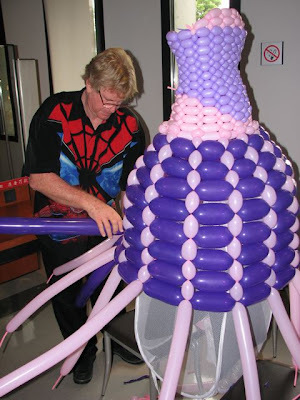 And in light of my balloonphobia, you can only imagine how terrifying I found this photo. I could hardly bear to upload it as that meant I had to look at it again. My hands are now starting to shake too much to type. So, back to some pretty stuff…). Don’t you love the scalloped edging at the bottom! I wonder if it’s any simpler to make than picot edging… hmmm…. And, there’s even a wedding dress! 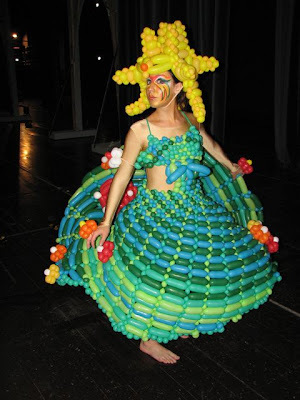 Brouhaha Heirloom Storage: we see to all your balloon dress storage needs*. *we are not responsible for any breakage, deflation, etc and your one-time storage price is not refundable. I don’t care that I charged you $500.00 telling you that it was far cheaper than paying $60-70 a month over time…always read the fine print before signing anything a lawyer gives you, OK? Expensive lesson but it could have been worse… it’s not a cell phone contract after all where if you want to break the contract they make you mortgage your firstborn! (I didn’t have a first-born to mortgage so they basically told me I would owe them $25.00 a month into perpetuity. Many, many strong letters, aggrieved phone conversations and complaint to the CRTC later, I was finally released from the contract. Which I guess I should have read. So there. Well, that’s enough beauty for one post, I think. 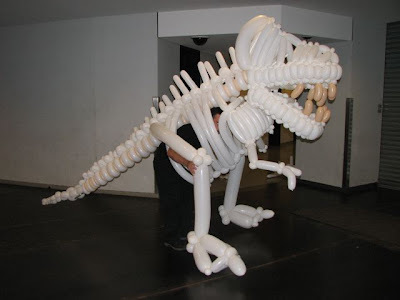 Although I won’t be rushing off to the balloon shop anytime soon, it’s always wonderful to see ultra-creativity! PS. Just looked up Apokreas… it passed on 2 February! Sigh. Lots of talking heads = lots of knitting time. At the seminar I knitted everything from the little slip of paper (an impromptu marker, if you like) to the top! 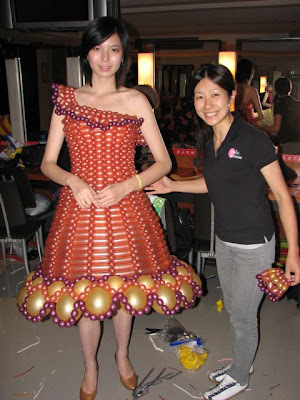 Valley of the Beads – a Brouhaha design!